SCOTTISH CLANS RAONUIL, OR MAC DONALDS OF CLAN RANALD. THIS branch of Clan Donald anciently held extensive insular possessions and other territories. In 1745 they inhabited the islands of Benbecula, Rum, and Uist, and the districts of Arisaig, Muidart, and South Morar, on the western coast of Invernesshire, a tract so rugged and mountainous that it was distinguished as the very highlands of the Highlands. “The people of these horrid parts could never believe they were accessible, till the king’s forces penetrated their fastnesses after the battle of Culloden, which was a prodigious surprise to the inhabitants.” The writer of these remarks confesses that, notwithstanding their local disadvantages and “barbarous” manners, they bred amazing numbers of cattle, and a “sort of wild horses,” the sale of which brought them much money; had plenty of venison, and were in better circumstances than most other clans, the rental being £1100. a year, well paid,”*1, an income then reckoned large, even for so great a chief as Clan Ranald! The descent of this clan is from John, Lord of the Isles, who married Ami, daughter and heiress of Ruarai (Rory or Roderic) of the Isles, a collateral branch of the Mac Donalds, about 1337. From Ruonal, the issue of this marriage, arose the generic appellation, Clan Ranald, and from Aluinn (beautiful), his son, is derived the patronymic of the cbief, Mac Mhic Allan. From the time of Ruarai’, who was chief in the early part of the fifteenth century, the clan became distinguished in the transactions of the country, and arose in importance, as the elder branch, from a series of reverses, consequcet on their collisions with government, were depressed, until at last they were so reduced, that Clan Ranald, as the nearest branch, was, by a modification of the Tanist law, acknowledged chief about 1530; and the abilities of his successors enabled them long to contend for possession of the dignity, when the others has acquired means to resume their former position. The hereditary honour of Captain of Clan Ranald could never be disputed, which not only referred to his own dependants, but denoted his rank among all who claimed descent from Ranald of the Isles. A remarkable event in the history of this clan illustrates the state of Celtic society in the days of independence. Outrageous as may appear the attendant circumstances, considering the practice of the Scottish kings, to keep one clan in check by the other, fomenting rancorous feuds and bloodshed, we can well believe the unsuspecting Gaël were goaded into acts of desperate policy, of which the anticipated advantage was so often taken with promptitude and severity. Dughall, who became chief in 1513, was of a froward, overbearing spirit, incompatible with the control which the sean’ìr, or elders of a clan claimed privilege to exercise over their patriarchal head; he consequently became greatly disliked; and, having committed several acts of cruelty and oppression, he was at last put to death; and, by common consent, Alastair, his uncle, was declared chief, and the sons of Dughall, then children, excluded. Alastair dying in 1530, Iain Muidartach, or John Muidart, usually designated of Ellan Tirim, his natural son, but subsequently legitimized, a man of great ability, had the address to obtain the chiefship and the estates. Meantime, Dughall’s son, Ranald, according to a usual Highland practice, was fostered by his uncle, Lord Lovat, and on arriving at manhood, the Frasers determined to put him in possession of his hereditary lands and title. James V. having seized and imprisoned John Muidart, a revocation of the charters which had been granted to him was obtained in favour of Ranald, who thereupon assumed his honours. Unfortunately, having been brought up with habits of economy unsuitable to the notions which his clansmen entertained of the liberality and profusion which ought to characterize a chief, he was very unpopular, and coming from a distant part of the country, of which the rougher Clan Ranald had rather a contemptuous opinion, he was sneeringly designated as Gallda, or from the low country. In this temper, it was to be expected that, upon the escape of John Muidart from prison, the clan should again hail him as their congenial chief, and compel Gallda and his party to retire, an outrage for which they could only look for a serve retaliation. John of Muidart was an extraordinary man, and led a troublous life, but he transmitted the chiefship in his own line. His fame is recorded in many a surviving tradition, and his skull was long preserved with veneration in the chapel of Ionain Island. The Captain of Clan Ranald was slain in the battle of Sherramuir, 1715. 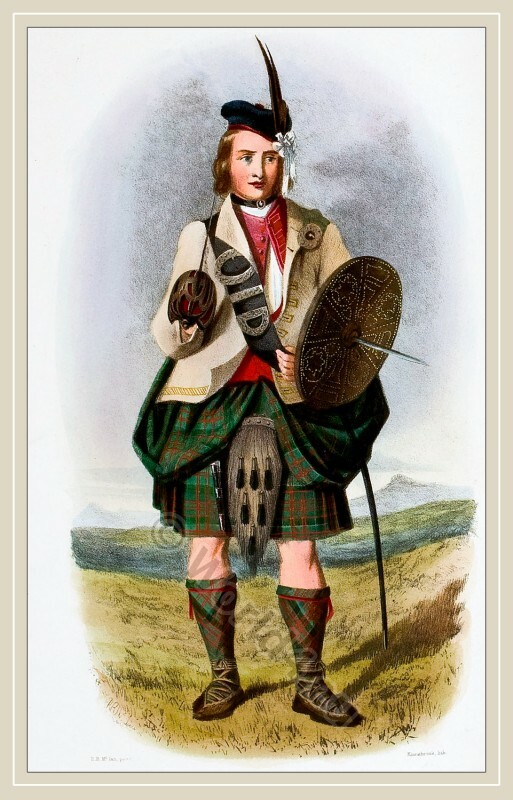 In 1745, the chief brought 700 to the Highland army; the MS. before quoted says, they numbered 800 “good men.” For a levy of Highlanders to assist Queen Elizabeth in Ireland, in 1602, Clan Ranald’s proportion was “tua,” and Glengarry’s” one hundreth men.”† It was in “the country of Clan Ranald” that Prince Charles landed, August, 1745, and the house of Mac Donald, of Ceannlochmuidart, first received the daring adventurer a grand Piobaireachd being composed on the occasion. In Glenfinan he unfurled the Bratach bàn, or white standard; and on the spot where it was then displayed, previously marked by a cairn of stones, the late Alexander Mac Donald, Esq., of Glenáladale, erected a column fifty feet in height, on the pedestal of which are inscriptions, in Gaëlic, English, and Latin, commemorative of this interesting event. The COAT ARMOUR is quarterly, 1st arg., a lion rampant gules, armed or; 2nd or, a dexter hand coupèe fesswise, holding a cross crosslet fitchee, gu. ; 3rd or, a lymphoid or galley, oars in saltire, sable, and in base a salmon naiant proper, in sea, vert; 4th arg., an oak tree, vert, surmounted by an eagle displayed, or. Crest, on a castle triple-towered, an arm holding a sword, proper. Motto, “My hope is constant in thee.” Supporters, two bears, each pierced by two arrows in saltire, proper. The BREACAN, or Tartan, differs from that of Glengarry in the arrangement of the white stripes. Mac Donald, of Boisdale, has a family tartan of a red pattern, with several colours agreeably varied. The SUAICHEANTAS, or Badge, is Fraoch gorm, Erica vulgaris, common Heath, the recognisance of all the Mac Donalds. The CATH-GHAIRM, or War-shout, is the proud defiance “Dhaindheoin cotheir-aidh e.” – In spite of all opposition. The PIOBAIREACHDAN are Failte Clann Raonuil, the Salute to the Chief, and the Cruinneachadh, or Gathering, sometimes called the Spaidsearachd, or March, composed in the war of 1715. Boisdale has his own appropriate Salute. The poem of Lachlan, poured forth to animate the clan during the great battle of Harlaw, 1411, is one of the most extraordinary of Gaëlic compositions, for its stirring energy and singular alliteration. There have been various other non-official bards of this clan whose works are very popular. The principal seat was Castle Tirim, the ruins of which, on a prominence in Loch Muidart, insulated at high water, attest its former strength; latterly the family has resided at Arisaig House. The figure is dressed in the Breacan an fheile, or belted plaid, of which this is a front view, the figure of Mac Gillivray, in the former number, showing its from behind, thus giving a perfect idea of the mode in which this picturesque, but now almost disused garment, is arranged. In a succeeding figure will be shown its advantage in bad weather, or a bivouac. Its amplitude is striking, and we are surprised that it should be neglected. especially by shepherds and drovers. Pipers might be so arrayed with much propriety and effect. The coat is lachdan, or the natural colour of the fleece, in which state cloth was frequently worn. The brogs are of the most primitive form, cut from a deer skin, worn with the hairy side outwards, and laced with a thong of the same material, a covering which stood the friction in walking the heath much better than its simplicity might lead one to suppose. The target is given from an old specimen, but is not otherwise peculiar than from the blade, twelve inches long, which is made to screw into the centre, thus forming a most formidable weapon for offence as well as protection. The bidag, or dirk, is of the fashion usual in the olden time. 1 MS.in the King’s Library, Brit. Mus., 104. 272. B. 2 Gregory`s” History of the Highlands, &c., &c. † Collectanea reb, Albanicis. *3 Evidence taken by a Committee of the Highland Society.